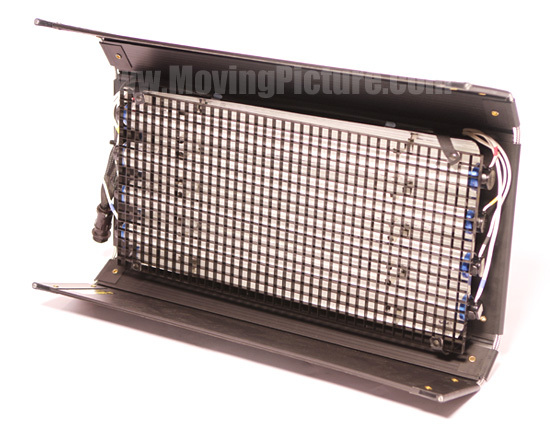 The Kino Flo 2ft 4Bank Kit,(1-Unit) w/ Soft Case is similar to a 1,000Watt softlight, but uses 1/10th the power. Color temperature doesn't shift when the light levels change. Lamps are long lived and operate outside the fixture. The fixtures are lightweight enough to tape to a wall. This Kino Flo 2′ 4Bank Interview Kit (120VAC) is part of the recent evolution of lighting for motion pictures, television, video and still photography. Using cool-running 2′ T-12 fluorescent bulbs (not included), the 4Bank fixture consumes 1/10 the power of an equivalent tungsten fixture, operates silently and flicker-free, and doesn’t shift color temperature when the light levels are changed. The 4Bank has four 40W lamps (available separately), with individual lamp control. The lamps have a long life, and the fixture is light enough to tape to a wall (with many more traditional mounting options available). The lamps can also operate independently of the fixture–the bulbs can be built into sets or a single tube can be hand held as an eye-light. Also included in the kit are a high-output ballast, a mounting plate, a soft carrying case and an extension cable. Lamps are not included.